Eternal Haunted Summer: If you could correct one common misconception about modern Paganism/polytheism, what would it be? Jennifer Lawrence: Hmmm … that we’re all alike, I guess. I know liberal pagans and polytheists, and I know conservative ones. I know straight pagans and gay pagans (and queer ones, and trans* ones, and lesbian ones and asexual ones…). I know those that are still in the broom closet and those that are not just out but screamingly, defiantly so. It’s a long list, and we’re no more cookie-cutter-made than non-pagans are. This, of course, is a misconception about modern Paganism/polytheism that non-pagans are more likely to hold than pagans, but still …. EHS: How do you describe your personal spiritual path/s? EHS: You just released the poetry collection, Listening for Their Voices. Congratulations! What is the origin of that title? JL: It’s pretty straightforward. I listen for the voices of the gods, the spirits of nature, and my ancestors. There’s wisdom in what They tell me. I trust that They’ll never steer me wrong. EHS: The book is dedicated to “Himself: Fjolnir, Yjungr, Gangleri, Hrafnagð, Sviðrir, Njotr, Oski and (most of all) Haptaguð.” Who is Himself, and what do these other names mean? 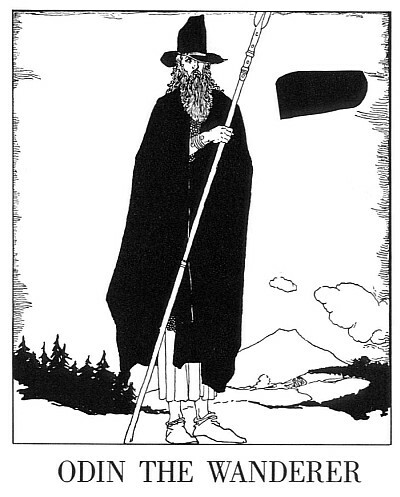 “Odin the Wanderer” from The Children of Odin by Padraic Colum and Willy Pogany. Courtesy of Wikimedia Commons. JL: Himself is Odin, and the other names belonging to Him mean (in order): Wise One, Stormy, Wanderer, Raven God, Calmer, Needed One, Wished For, and Fetter-God. EHS: The book is divided into four sections: Voices From the North, Ireland and the Celtic Lands, The Shores of Greece, and Other Tales. How did you settle on that organization? JL: I chose to organize the first three sections, which are all poetry about gods and goddesses, by their respective pantheons. The fourth section, “Other Tales”, is a smaller section that collects my poetry on the spirits of nature and my ancestors. I’m hoping that fourth section will be larger if I do a second volume. EHS: Were there poems that did not make it into this collection that you hope to include in a future volume? JL: There were some early works I decided weren’t good enough to fit into this volume, but other than that, this collection contains all the poetry I’d written on the subject up to the point where I submitted it for publication. However, I’ve (obviously) continued writing, and in a few more years I may have another volume ready to go. EHS: Which was the most difficult poem to write? Why was it so difficult? JL: That would probably be “Surrender”, because it deals with personal matters that were extraordinarily difficult to come to terms with. EHS: What sort of research went into writing these poems? Do you write at a desk covered in books? Or take long walks? JL: Not much research. Mostly inspiration. I write at my desk, although I’ve been known to dictate stuff that comes up unexpectedly into the voice recorder of my phone and transcribe it later. JL: Well, people will scoff if I say that it’s not that important, because — as the title states — I’m just listening to what I’m being told. The poems for my ancestors do rely on personal experience and some insight. 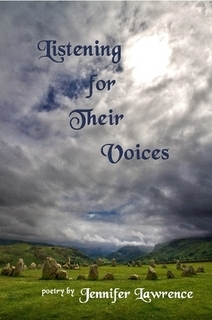 EHS: Well-written and respectful poetry about the Gods can be difficult to find. Which books and authors would you recommend? JL: Pretty much any of the devotional anthologies from Bibliotheca Alexandrina, and numerous works from Asphodel Press … authors include Galina Krasskova, Morpheus Ravenna, Sannion, Morgan Daimler, P. Sufenas Virius Lupus, Rebecca Buchanan, Melia Suez, Krysta Roy, Lykeia, Allyson Szabo, Amanda Sioux Blake, Melitta Benu … I’m sure there are authors I’ve not listed here, either through lack of introduction to their work or simple forgetfulness. EHS: You released Listening for Their Voices through Asphodel Press. Why that publisher, and would you recommend them to other authors? JL: A number of authors whose work I respect have published through that publisher, and my experience working with them has been exemplary. I wouldn’t hesitate to recommend them to others. EHS: What advice can you offer to other aspiring Pagan/polytheist authors? JL: When it comes to wanting to publish your work: Do it for the Gods. Do it for your ancestors. Do it for the spirits. But don’t do it to get rich, because poets generally don’t end up on the bestseller list. EHS: Which book fairs, conventions, conferences, or other events will you be attending in the foreseeable future? JL: I’m working on arranging a couple of poetry readings in the Chicago area, but I don’t have anything nailed down at this time.